I was standing in the early evening light at the edge of yet another deep gully that stood in the way of our progress to the SW. Since we had been hiking for 10 hours, George Ritter's classic comment from the Dirty Devil trip kept rolling over and over in my mind: "It's getting tired out here!" And so it was. I had not yet come to the realization that we had gained nearly 2000 feet of elevation in very soft sand, and still another gorge, albeit a small one stood in our way. I started to move off to my right, doing a traversing climb through thick brush, Ron, in the lead, having convinced me that an apparent progress-blocking draw in front of Susie, in the bottom of the chasm, was the real deal, not an optical illusion. So I pushed thru the vegetation, my tiredness making it very hard to stand on steeply sloped ground. As we get older, the "herd of cats" effect has an increasingly greater impact. I seem to say this every year, but at no time have we ever had such a complex process for getting 9 people started on an canyon backpacking trip. Carol, a retired dentist from East TN, was the newest crew member, and he had come out to his condo near Utah's Powder Mountain to adjust to the altitude more than a week before the trip. Barbara and Ray (the latter would not accompany us further than our first day) came out a few days early to backpack in Upper Gulch. He had missed that part of the fun last year, and wanted to be sure he had added it to his "life list." Andy and Sue, now that their new home in Pagosa Springs, CO was completed, were flying to Albuquerque Friday evening, so that they could stop in Pagosa on the way back to ABQ at the end of the trip. 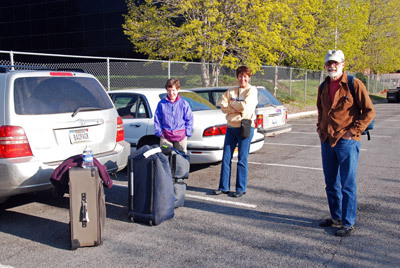 The three coming directly from Knoxville, Will, Terri, and Ron, had all taken separate flights on different airlines. And of course, Susie and I had the easiest trip: just throw all the gear, including two cases of Moose Drool beer for Carol to store in his condo, in the back of our Highlander and head for Salt Lake. Well, maybe "easy" is not the term to use. Susie and I left Bozeman at the appointed hour of 6 am. 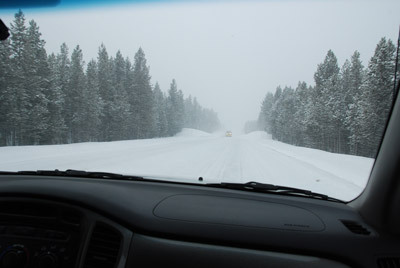 We were smugly congratulating ourselves that we had not had to drive down to Salt Lake the previous day, as it had snowed pretty hard. On this Friday morning, the roads were nice and clear. OK, clear to Ennis, MT, 60 miles or so from Bozeman. Then the snow hit. We crossed the Divide at Raynolds Pass, on roads packed with snow and ice. We had seen hundreds of deer, pronghorn, and elk, along with bald eagles and a moose along the Madison River. Felt like going thru Yellowstone. Snowy Yellowstone. Will called as we were driving through Island Park, ID to tell us his plane was going to be delayed at least an hour. When I told him we were driving through a significant snow storm, he, being of East TN stock and having to struggle with the concept of serious snow in late April, expressed amazement. I told him: "Will, it is late April, and it is snowing on the Continental Divide. So, what's your point?" Once we dropped off the Divide Plateau near Rexburg, ID, the snow stopped and spring arrived. The rest of the drive was uneventful and we managed to coordinate with Will, to pick him up as planned, albeit late, at the Salt Lake airport and whisk him to the REI in Sandy, where shopping is always a good thing. Then back to the motel, and then to the airport to pick up Ron, and eventually Terri. Then off to dinner at the Red Iguana, one of Salt Lake's noted Mexican restaurants. Carol, and his friend Marlene, from Ogden, joined us. Getting seated was surprisingly quick, given that it was Friday night. The food, as always, was super. If you have not tried the Red Iguana, you must. It does not look like much, and the parking is spotty, but any hassle is worth it. Saturday was supposed to be our "positioning" day. It used to be that we would fly across the US on Friday night, and drive until late at night, get up the next morning, cover a few more hundred miles and start hiking by early - late afternoon, and arrive in camp the first night exhausted. No more. Always better to have some time to make up for things not going as planned. Saturday started out pretty well. Carol arrived nearly on time from Ogden with his 1993 Ford Aerostar mini-van that was to be our primary cargo vehicle, and the one he and Will would use after the backpack to do some sight seeing. 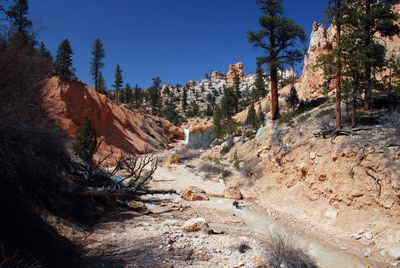 We loaded our Highlander and his van and the 6 of us headed for Bryce Canyon. We stopped in Beaver, UT for lunch, and the place had changed so much since I spent the night there 8 years ago that I could not see the motel I stayed in. Think "sea of fast food places." But a good place to get a quick bite to eat. 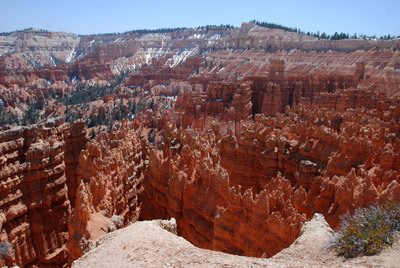 We made it to Bryce Canyon National Park by 1:30 pm, and did the tourist thing by hitting some of the more popular overlooks. Susie noted that she saw a little puff of smoke come out of one the wheel wells on Carol's minivan. I thought such was strange, but did not give it much more thought. From the overlooks, we headed down off the escarpment to the Mossy Cave trailhead. I was concerned about finding it. I should have been concerned about finding a parking place. Wow, a popular spot. This little area is pretty and it is a short walk of a mile round trip. Not very hard, so you can understand its popularity. 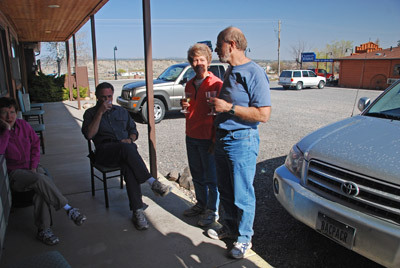 As anticipated, Andy and Sue, having driven the long way from Gallup, NM that morning, following the flight to Albuquerque, met us on the return walk. So we had most of the chicks accounted for, and we suspected that Ray and Barbara were cleaning off after finishing their backpack in Upper Gulch at our motel. So that was the next stop on the itinerary. I had originally tried to get us rooms in Cannonville, UT, where one of the Grand Staircase-Escalante National Monument (GSENM) Visitor centers is located. It would be a few miles closer to the trailhead, was my thought. Well, sometimes, fate intervenes and you get lucky. As it turns out, although I had called weeks ahead of time to make a reservation, the one motel in Cannonville was filled, so we had to get rooms in Tropic, at America's Best Value Inn and Suites. As it turns out, there is not a single restaurant in Cannonville. There are two or three in Tropic. So we sign in for our rooms (yes, Ray and Barbara had already arrived, and Carol pulls around, hops out of the car, and announces that he barely has any brakes. I look down at his right front wheel well, and there is fluid dripping from it. Since there were no puddles in the gravel parking lot, I figure we are in serious trouble. I felt the fluid and it definitely feels like something other than water. To make a long story short, we convinced Carol to drive his van, with Ray, the expert mechanic following back up to Ruby's Inn at the entrance to Bryce Canyon. In turns out that he had blown a brake cylinder on his wheel, and it would take them a few days to get a part. So the van would be ready to drive - at the END of the canyon trip. That evening was spent sipping some remaining wine, and doing final gear packing, and mulling over how long things would take in the morning. When we had been getting ready to leave Bozeman on Friday morning, given the weather, I just grabbed a fleece jacket and threw it in the car, due to the local cold weather. I decided to remove my lightweight fleece pullover and substitute the heavier fleece jacket. Such would turn out to be one of the few lucky things that had happened our positioning day. To view additional and different photos of the trip, go to Will's SmugMug photo gallery.